To my spiralizer I am dearly devoted, in fact, it is accurate to say that in my household (who am I kidding? Bite-sized apartment), zucchini noodles, affectionately monikered zoodles, are the preferred choice for role of tomato sauce underbelly. There’s no denying that the complementary tastes of thin, earthy zucchini strips and tangy, acidic tomatoes just rocks; admittedly, for a long time I was very content with this Christmas-colored combo. But recently, I got the itch to take my zoodles someplace new. 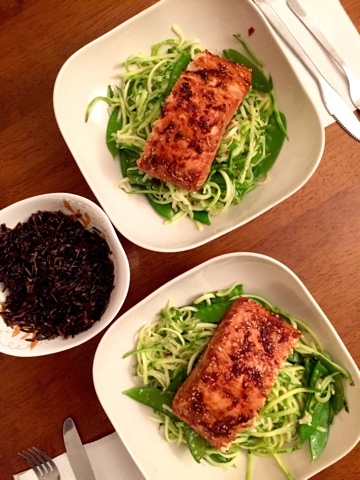 So I journeyed my zoolding home base from Italy to Japan—swapping rice noodles/regular rice for our beloved verdant ribbons in this Teriyaki-Ginger Salmon with Sesame Zoodles recipe. My travels did not disappoint. First of all, let me point out that while the draw of this recipe is obviously the creative addition of zucchini for a healthier teriyaki, it’s the teriyaki glaze and salmon prep that are the true all-stars. The teriyaki glaze is delightful, rich and caramelized without being saccharine sweet. I urge you to double the glaze and cook the excess alongside the salmon, so when it pools, bubbling and fragrant, at the bottom of the pan, you can pour evenly over each bowl of zoodles for maximum sopping power. As for the salmon, the finished product simply melts in your mouth. 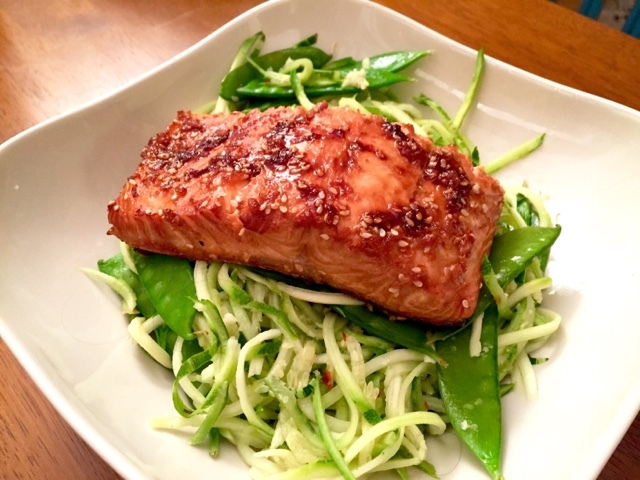 Has this become my go-to recipe for salmon teriyaki, whether zoodles are involved or not? You bet. Marinating overnight really helps to saturate each piece of fish, so while the top surface finishes glazed and thickened, the flavors still permeate from every side. The sauce, salmon, and crunchy snow peas are so delicious, in fact, that the zucchini is relegated to the shadows, a mere green-hued vessel for soaking up sauce. Which, if you think about it, is the truest form of any of these carbs—the accessory behind the standout elements of the dish. 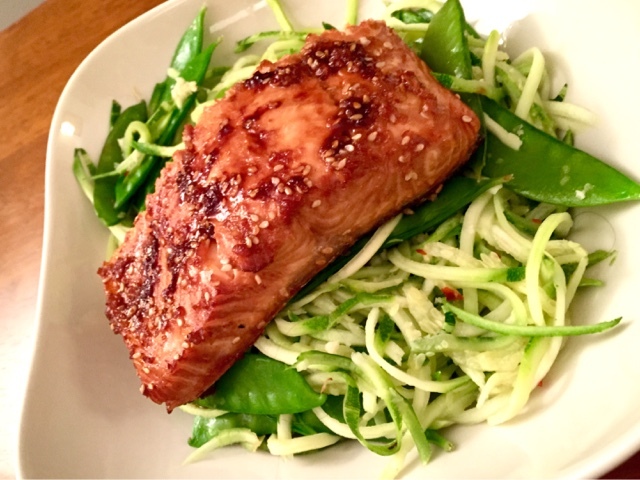 In this way, the zoodles do their job perfectly: relinquishing unwanted carbs while maintaining fullest flavor, allowing you to guiltlessly enjoy a good ol’ bowl of salmon teriyaki. 1. Preheat oven to 425 degrees. Line a baking sheet with parchment paper or foil. 2. Whisk together all teriyaki marinade ingredients in a large zip-lock plastic bag. Add salmon, shake lightly to coat. Place in refrigerator for at least 15 minutes, preferably many hours or overnight. 3. 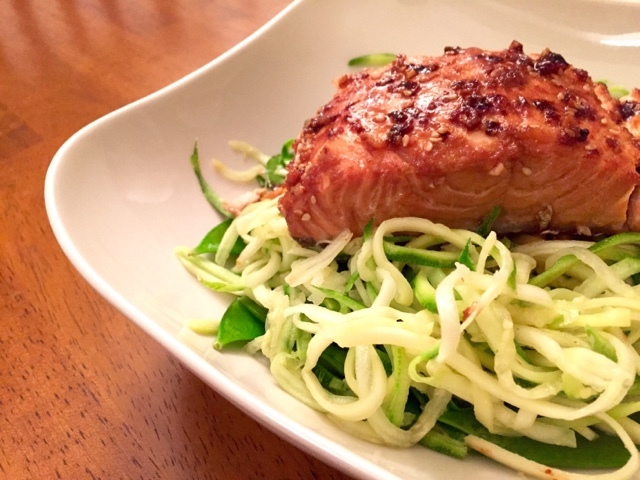 While salmon marinates, spiralize your zucchini and set aside in the refrigerator. 4. Remove salmon from plastic bag and place on prepared parchment paper/foil. Pour entire marinade over fish. Bake the salmon for 15 minutes, or until fish flakes easily with a fork. 5. After the salmon has been roasting for 10 minutes, place a large skillet over medium heat and add sesame oil. Once oil heats, add garlic, ginger, scallions, and red pepper flakes. Cook for 30 seconds (or until fragrant), add snap peas and zoodles. Cook for 3-5 minutes or until noodles soften to your preference. 6. Plate each portion of zoodles, followed by a salmon filet. Distributing evenly among servings, top with remaining cooked marinade, a sprinkle of sesame seeds, and a few minced raw scallions.